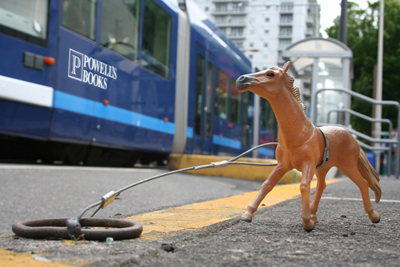 (horseproject.home.comcast.net): little plastic horses tied with steel cable to the historic horse rings that dot the curbs along Portland’s sidewalks is a must see. The project is approaching its first anniversary with astounding success. Not only are the horses now everywhere you look, but herds of pigs have been popping up as well! Maybe Indiana was inspired by the large horse outside Dazzle at Northwest 23rd Avenue and Irving Street. 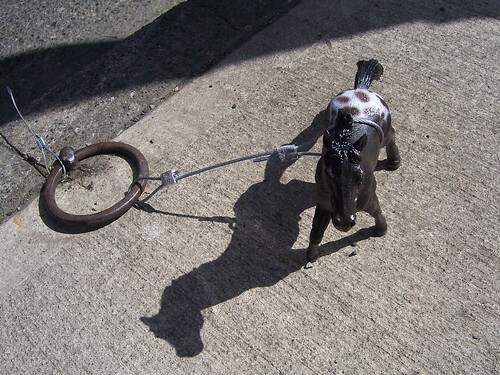 Owner Faviana Priola found the unnamed stallion in 1990 at an antique market underneath London Bridge and liked him so much she shipped him home from the U.K. Indiana's comment on the Dazzle Horse? "I think they should tie him to the nearest horse ring, so he doesn't run away, but maybe he's well trained." Shouldn't be a problem—Priola brings the horse in to sleep every night.